It's no secret that I love to scrapbook. My 8 year old, Sara, is a little artist too. There is nothing she loves more then staying busy creating. The challenge with creating so much is keeping all those special creations safe and organized. Last week I wrote about teaching your child how to keep their room clean. For Sara, that also means not letting her art work get out of control. What can you do with your child's art work? Sara came up with the idea of a rotating scrapbook. She keeps her drawings in protective sleeves then in a 3 ring binder. How Simple! What do I mean by rotating? Well, we switch them out once in a while. Sometimes, with the ones we are taking out we mail them to Grandmas - she loves stuff like that! We also have a rotating wall picture holder that I purchased at Lillian Vernon. This would also be great for a teenager. 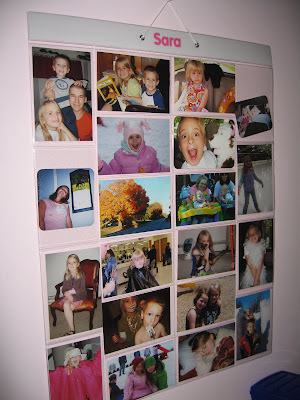 There are lots of pockets where kids can store their favorite photos. This online store has some great storage ideas for kids. Sara also loves to journal. Sometimes she doodles and sometimes she writes poetry. She loves to collect notebooks. I bought this simple magazine holder at target. How pretty! Great ideas! 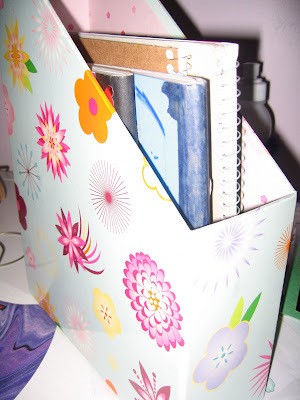 I especially like the magazine folder for the journals. 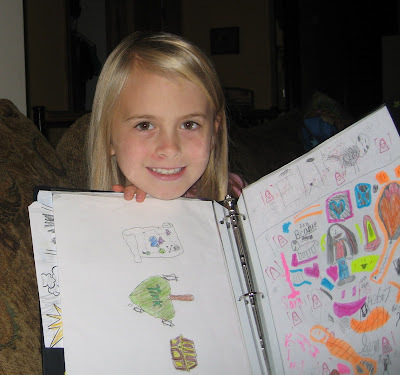 My middle son loves to draw, journal, the works so I am gonna have to try some of these storage ideas. Denise... that is so true! Blogging is the new scrapbooking. What a beautiful photo of your daughter! Thanks for sharing, Dana! One idea I have seen (and want to do) for showing off kids' artwork is hanging cute clips on ribbons from a curtain rod or something similar. Then you can switch them out and enjoy each one. Thanks for entering my giveaway...and I am absolutely AMAZED by your sunflower!